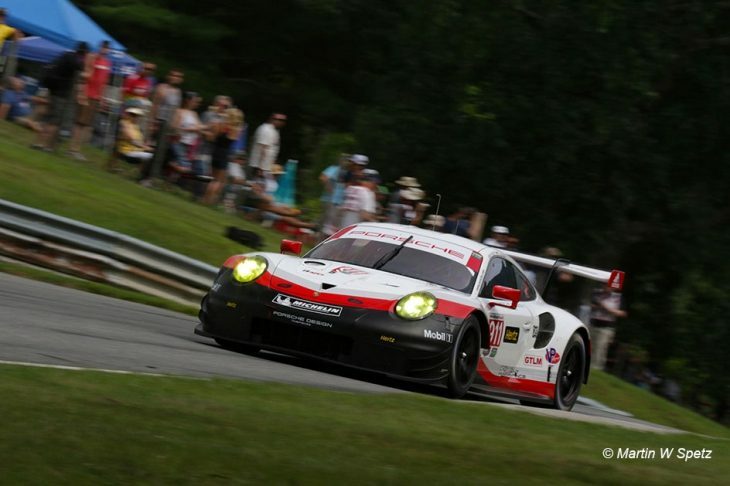 Porsche GT took a 1-2 finish at the GT-only IMSA Northeast Grand Prix at Lime Rock Park, with Patrick Pilet and Dirk Werner in the #911 Porsche leading the way, scoring the new mid-engined 911 RSR its first ever victory. Pilet finished the race 14.5 seconds ahead of Laurens Vanthoor in the sister #912 Porsche, which started from Pole Position after Gianmaria Bruni’s performance in Qualifying. The #911 Porsche ran inside the top three positions throughout the race. Werner qualified third, but jumped to second at the start of the race and ran behind Bruni for the first 49 minutes of the race before taking the lead when Bruni came in for his first pit stop. Werner pitted two laps later to turn the car over to Pilet, who rejoined the race in third place, but one spot ahead of Vanthoor in the #912. Pilet took the lead for the first time an hour and 17 minutes into the race once the first pit-stop cycle was completed. Pilet lost the lead when he made his second and final pit stop, but reclaimed the top spot for the final time when Antonio Garcia pitted the #3 Corvette Racing C7.R from the lead. After that he went unchallenged en route to his eighth IMSA race victory. It was Werner’s ninth career victory in IMSA history – including previous wins in both the GRAND-AM Rolex Sports Car Series and American Le Mans Series – and his third in the WeatherTech Championship. Werner joined the Porsche GT Team this season after spending the past several seasons with BMW Team RLL. “For me personally it’s a great day,” Werner said. “I just joined Porsche as a factory driver and to be the first together with Patrick, yeah, it’s a very good feeling. But it’s for the team and it feels good because they put in all the work, especially developing the car for such a long time, I think it’s over a year now. It was the first win for the Porsche GT Team since last September’s race at Circuit of The Americas, which also was the last time the team swept the top two spots in GTLM. The final spot on the podium was decided after an enthralling battle between Martin Tomczyk in the #24 BMW Team RLL BMW M6 and Garcia in the #3 Corvette. In the end the BMW would take the honours. Behind Garcia in fifth, the duo of Ryan Briscoe and Richard Westbrook were the first of the Ford’s home in the #67 Chip Ganassi GT. 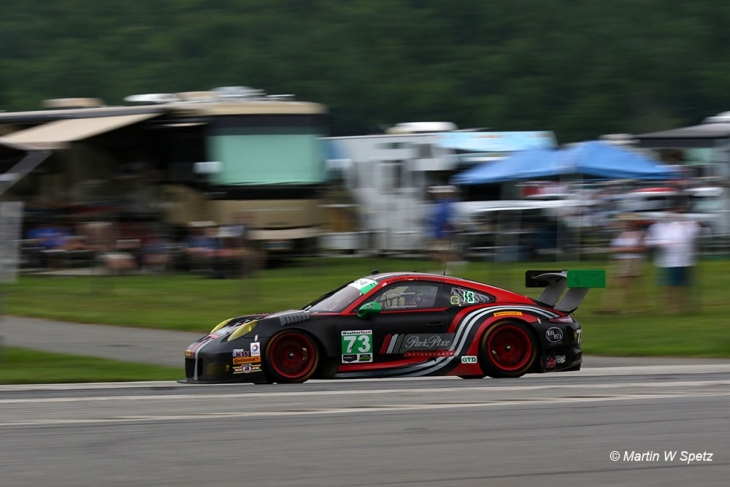 Porsche was also victorious in the GTD class, after Park Place Motorsports’ 911 GT3 R of Joerg Bergmeister and Patrick Lindsey scored the team its first win in IMSA since last year’s Petit Le Mans. Bergmeister inherited the lead on the final series of green flag pit stops with 59 minutes remaining and went on to lead the race’s final 57 laps. 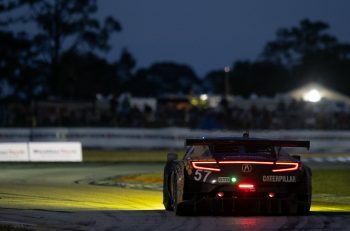 The two hour, 40-minute race was run caution free for the first time in the WeatherTech Championship since another GT-only race at VIRginia International Raceway in 2015. Bryan Sellers in the #48 Pole-sitting Paul Miller Racing Lamborghini finished 3.4 seconds off the lead Porsche, taking himself and Madison Snow’s best finish of the season. The final step of the podium was taken by another Porsche, the returning Alegra Motorsports Porsche 911 GT3.R of Patrick Long and Daniel Morad. 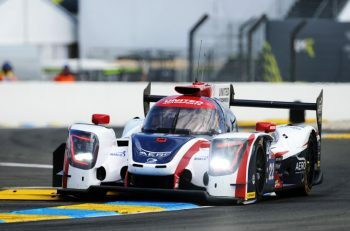 It was an impressive result for the Daytona 24-winning team, which only confirmed that Long would drive with Morad a week prirot to the race. Further pack, the GTD title leaders in the #63 Scuderia Corsa Ferrari 488 GT3 – Christina Nielsen and Alessandro Balzan – finished sixth, the first time the duo missed the podium since the season-opening Rolex 24 At Daytona. Despite finishing outside the top five, they still lead the class standings. 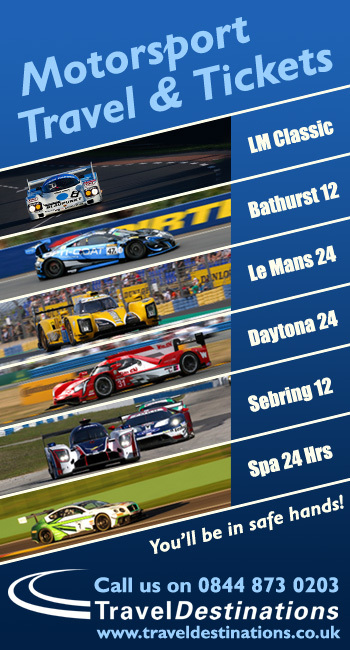 The next round on the 2017 IMSA WeatherTech SportsCar Championship calendar is the Continental Tire Road Race Showcase at Road America on August 3-6.